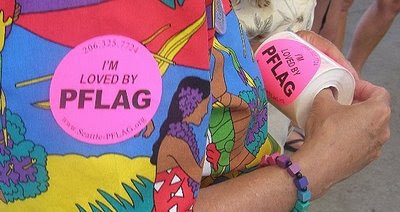 Event was sponsored by many organizations, businesses and individuals including Parents and Friends of Lesbians and Gays P-FLAG. A friend across USA wanted to see me dancing, so I set my camera on a table at Rumor's Cabaret and pushed the button. This was during Bellingham Pride Festival 2008 before the bigger crowds came in to the dance floor. It was a fun day. Before Pride, I was one of 3 people interviewed on KGMI Radio's PM Bellingham show. The interview was about 1/2 hour. Others were Betty Desire, of course, and Nick Milhoan from Whatcom PFLAG.